Card Worthy: Love a man in a kilt! The only thing Sir Hot was missing was his sporran, so I used my Unity Vicious Circle stamp to create one, cut out the centre with my Coluzzle circle template to reveal luscious fur (don't worry, it's faux-no animal was harmed in making this card) and made the base and flap with nestie 'labels four' in two sizes. 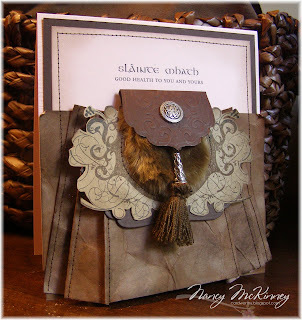 I also embossed the flap with one of the folders from the Cuttlebug Fancy Corners Embossing Set before adding a Celtic-looking button and tassel with a bead I picked up a Michael's. 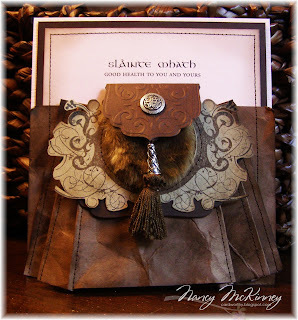 To create the faux leather look, I sponged SU close to cocoa cardstock with Tim Holtz Distress Ink in walnut and tea dye, them crumpled the paper up in a ball and carefully unraveled it. To create my manly kilt (don't you love a man in a kilt? ), I folded the paper in a type of slanted accordion fold, then stitched along the pleats. Even though my name is McKinney, I'm really a Ferguson, which means my sentiment had to be Scottish (hmmm, just like Gerard Butler). 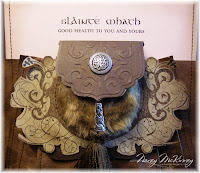 In Scots Gaelic, Slàinte Mhath apparently means 'Good Health' and I added the English sentiment so it makes sense to the non-Gaelic. I used Aon Cari Celtic and Adobe Garamond Pro fonts to create my sentiment and printed on retired SU pink pirouette cardstock. Where do you come up with these ideas...this is FABULOUS!!!! I'd love to have a peek into your brain when your creating one of these works of art!! !